Some friends and I got the long weekend off to a perfect start with a cookout in the park. This monochromatic look had me feeling breezy and comfortable but still put together. I kept up the relaxing activities and retro style all weekend long. More outfits to come! How was your weekend? 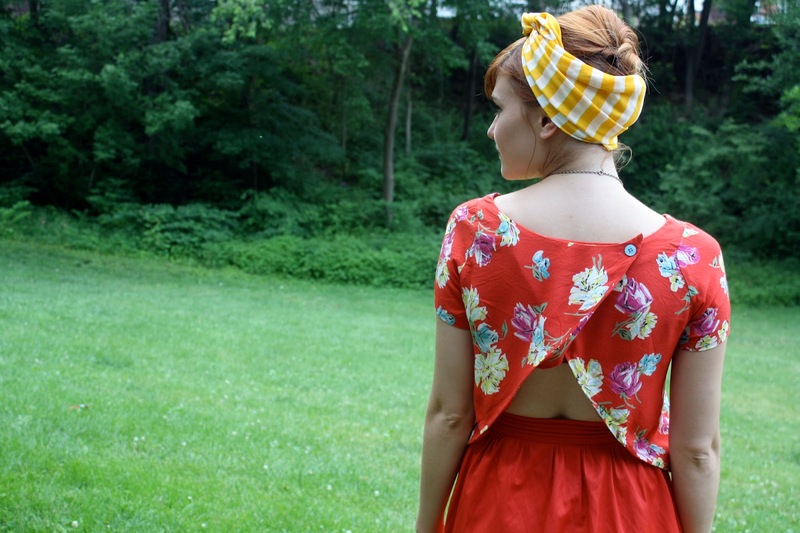 SO so darling, one of my favs you've worn...I love that it's got this 50s vibe with the flared skirt and tropical floral and head wrap...but super modern with your bright red and cute cutout back. What a cute and playful outfit; it's perfect for warm temperatures. I love that top,and I've got to try that scarf in my hair some day. Super cute. I love the retro look! I especially love the mix of floral and stripes. So cute! I really like the pop of yellow! I really love tops with that kind of back too. I'd rather show my back rather than a low cut top ANY day! I love this look! The 2 prints together are brilliant. This outfit is absolutely wonderful! I'm in love with that top and the open back on it. Your hair looks great with that scarf too. Such a breezy look.